Manila, Philippines- Due to continuous flooding and heavy rains as a result of Southwest Monsoon (Habagat) enhanced by Typhoon 'Maring' (Trami), several local government units (LGUs) in Metro Manila and parts of Luzon still declare today class suspensions for tomorrow, Tuesday August 20, 2013. August 19, 2013: Typhoon 'Maring' and Habagat bring non-stop rains over Metro Manila, Luzon. Announcement of LGUs done thru social media particularly on micro-blogging site Twitter and networking site Facebook. Make sure to refresh this page to check if #NOCLASSES (#WalangPasok) for tomorrow has been announced. In the official Twitter page of Muntinlupa City, Muntinlupa Mayor Jaime R. Fresnedi still declares no classes tomorrow, Aug. 20, 2013. All levels public & private school. #walangpasok"
Edwin Olivarez, the new city mayor of Parañaque announced via Facebook post that classes in ALL LEVELS in Paranaque City are still SUSPENDED tomorrow, Aug.20,2013 due to the damage brought about by typhoon Maring. On the other hand, all Paranaque government employees are expected to return to work tomorrow. President Joseph Estrada, Manila Mayor made announcement thru his Twitter post, @PresidentErap: All levels of classes suspended, but not work. Manila Mayor @PresidentErap: Only all levels of classes suspended, but not work. As of 4:00 pm today, Tropical Storm “MARING (TRAMI) was estimated based on all available data at 580 km East of Itbayat, Batanes (20.0ºN, 128.1ºE) with maximum sustained winds of 75 kph near the center and gustiness of up to 90 kph. It is forecast to move East at 7 kph. Metro manila, Ilocos region, Central Luzon, CALABARZON, Panay Island and the provinces of Benguet, and Occidental Mindoro will experience monsoon rains which may trigger flashfloods and landslides. Zamboanga peninsula, Northern Mindanao, the rest of Luzon and Visayas will have cloudy skies with light to moderate rainshowers and thunderstorms. 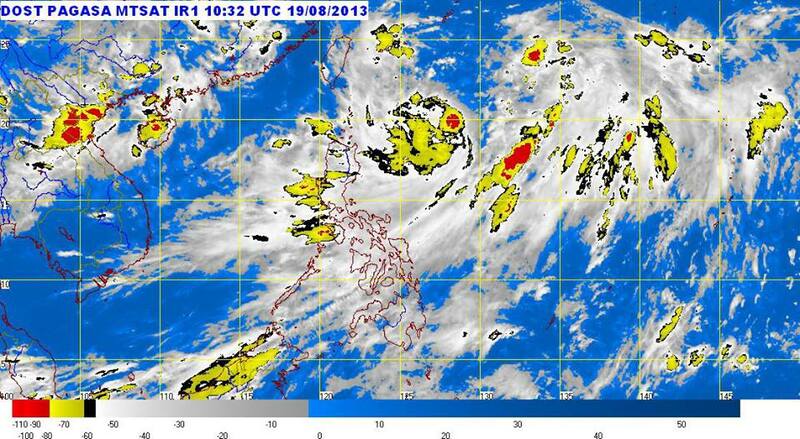 The rest of Mindanao will be partly cloudy to cloudy with isolated rainshowers or thunderstorms. Upon the recommendation of PAGASA, the Executive Secretary, Edwin Lacierda today had ordered the suspension of classes in ALL levels over Pangasinan, Benguet, Bataan, Zambales, Tarlac, Pampanga, Bulacan, Rizal, Laguna, Cavite, Batangas, Occidental Mindoro and Metro Manila. Likewise, the Executive Secretary has also ordered the suspension of work in the Government Offices in Metro Manila except those involved in disaster risk reduction and management.